 Recent reports suggest that the global recovery is faltering, raising concerns that we may soon see a replay of the sovereign debt crisis that rocked Europe -- and, eventually, the U.S. and the rest of the world -- earlier this year. 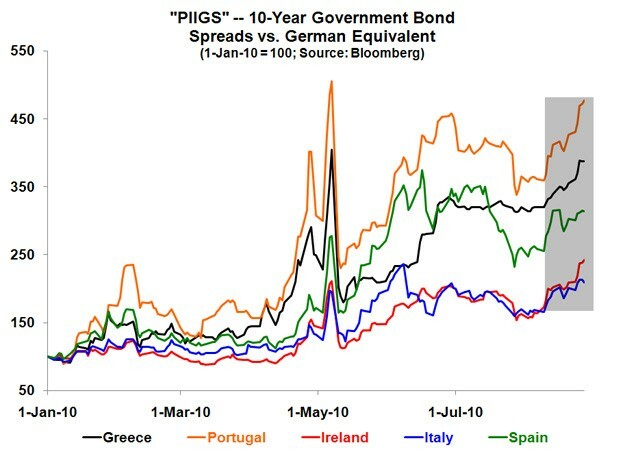 One driver for the upheaval that erupted last spring was the growing concern that countries in the region that had mismanaged their finances, most notably the "PIIGS" -- Portugal, Ireland, Italy, Greece, and Spain -- might feel compelled by deteriorating circumstances to restructure their debts, or renege on them altogether. Those fears eventually spawned broader worries about the fiscal health of other nations in the eurozone, as well as banks with large holdings of PIIGS-related debt, and even the viability of the euro itself. Subsequent efforts to rebuild confidence, including government-sponsored bank "stress tests" and large injections of central bank liquidity, helped calm things down. 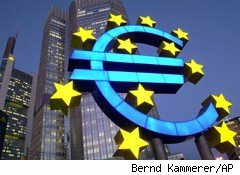 Now, though, economic data from the U.S. and China is pointing to a potential reversal of fortunes, and experts like Nobel Prize-winning economist Joseph Stiglitz are warning that Europe is at risk of falling into a double-dip recession. Together with rising public resistance to government austerity measures, the pressures could leave financially stretched nations in the region with nowhere to turn.  In fact, a quick read of recent trends in European credit and equity markets suggests that investors are beginning to anticipate another round of upheaval along the lines of what took place only a few short months ago. 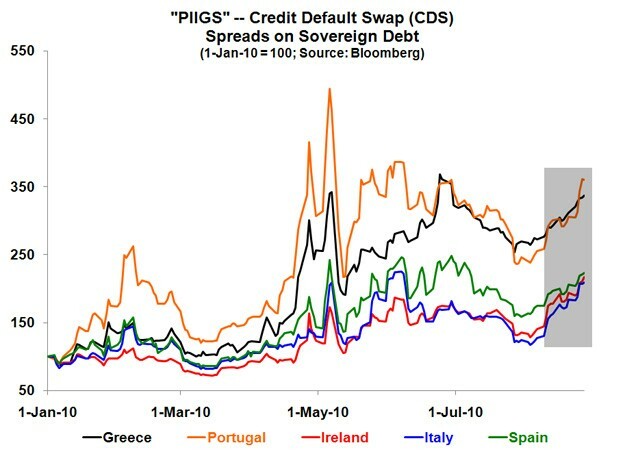 This first chart, for example, shows that the value of credit default swaps -- which, loosely speaking, are a form of insurance against a debt default -- on the sovereign obligations of the various PIIGS has climbed sharply, and is above or near the extremes reached back in May. Another chart reveals that the differences between the yields of bonds issued by those five European countries and that of Germany, widely viewed as having one of the best credits in the region, have also jumped, a clear sign that financial stress is increasing. 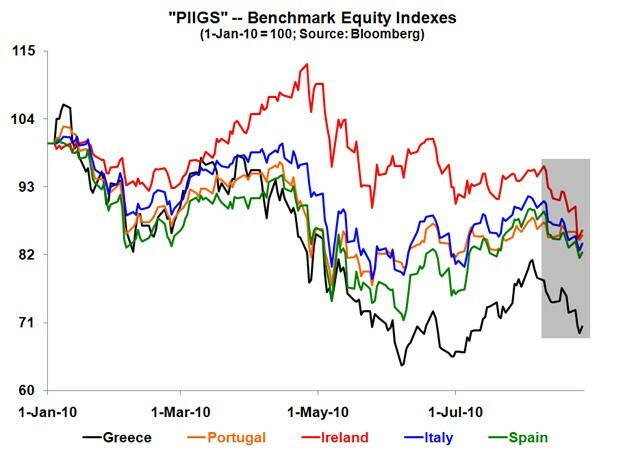 And finally, this last chart shows that Portuguese, Irish, Italian, Greek, and Spanish share prices have also come under pressure in recent weeks. Of course, stock markets elsewhere have not fared all that well either, but the weakness being seen here comes on top of the dramatic slides that these markets have experienced since the start of the global financial crisis in 2007. In the end, of course, round two of the European sovereign debt crisis may well remain confined to the region. Better still, our markets could benefit from the perception that the U.S. remains a safe haven despite everything that has happened during the past few years. But if recent history is any guide, odds are that it won't be long before serious troubles over there start to cause big problems over here.